Adress: Budapest, V. ker. Balassi u. 25.
Business hours: If you want to see us collection please call us and have an appointment. 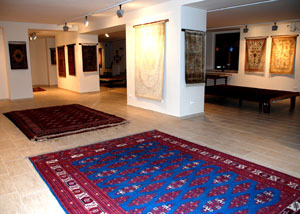 The reputed, reliable "carpet dealer" and "collector" is a decisive character in the international trade of good quality oriental carpets. I myself have been collecting silk carpets since 1996. The soft draping of the material, the virtuous world of the colours, the daintiness of the patterns has fascinated me. The carpets are first of all pieces of art, however, last but not least they are also excellent investment! Collecting carpets means not only the pleasure of possessing something but also the pleasure of knowing something. There is no book in the international literature, which should not mention Hungary before the World War II. as a remarkable carpet collecting "great power" and the collection of the Museum of Fine Arts among the most important museums. I believe I have to see where, how and under what cultural conditions these wonderful pieces are or have been made. Depending on war- and political situation, practically I have been travelling from Atlas Mountains to China and visited all the important carpet making centres. Now I buy not only silk carpets abroad, as it would break my heart not to buy also the specialities of wool carpets. As a "collector" and "carpet dealer" I will introduce myself to the general public in the Antique Interior 2005. In the future a preliminarily agreed appointment is needed in case of buying. Budapest,V. distric, Balassi street 25.